Download "B. The governance leadership team"
4 DOMAIN III: Board and Community Relations Domain Description: In order to ensure improved student achievement and organizational effectiveness, the board creates and sustains healthy community relations, models professional relationships, creates a culture of mutual respect, and serves as a charter school advocate for effective collaboration and engagement of internal and external stakeholders. A. The governance leadership team develops a process for creating a culture where input is sought, heard, and valued. B. The board develops policies to ensure effective communication and engagement of all stakeholders which support the strategic plan, desired culture and continuous improvement of the charter school. C. The governance leadership team ensures processes that develop, communicate and maintain procedures for communications by stakeholders which result in resolution of issues and concerns supporting the strategic plan, desired culture, and continuous improvement of the charter school. 1. 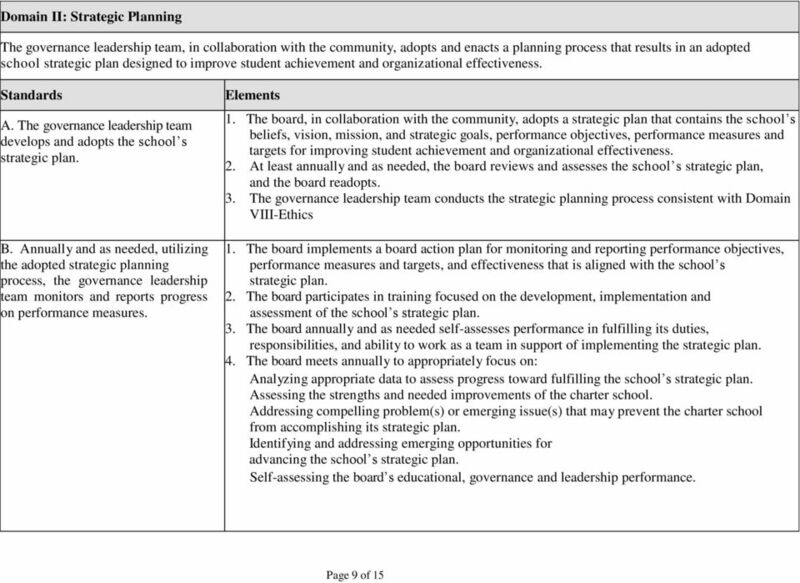 The board aligns its actions and decisions, which impact board and community culture, to the school s strategic plan. 2. The interactions of the board with the community create a culture in which ideas are sought, heard and valued, and are based on collaborative review of research and data. 1. The board develops and supports implementation of a communications plan aligned with the school s strategic plan. 2. 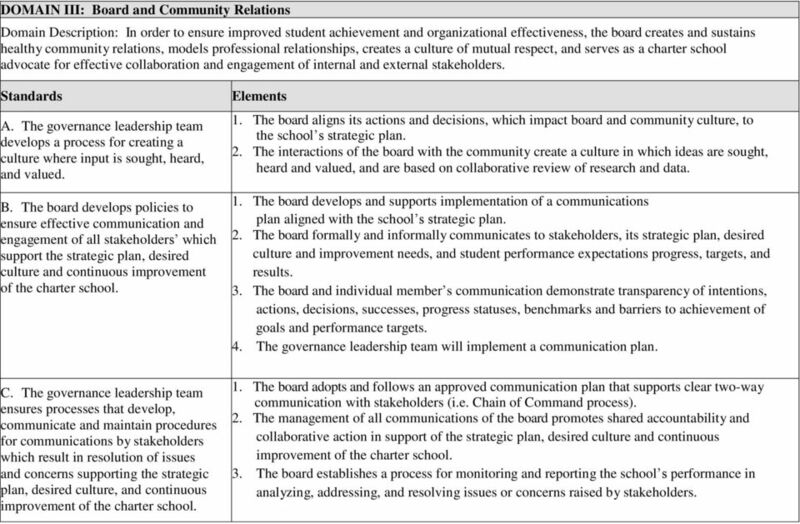 The board formally and informally communicates to stakeholders, its strategic plan, desired culture and improvement needs, and student performance expectations progress, targets, and results. 3. The board and individual member s communication demonstrate transparency of intentions, actions, decisions, successes, progress statuses, benchmarks and barriers to achievement of goals and performance targets. 4. The governance leadership team will implement a communication plan. 1. The board adopts and follows an approved communication plan that supports clear two-way communication with stakeholders (i.e. Chain of Command process). 2. The management of all communications of the board promotes shared accountability and collaborative action in support of the strategic plan, desired culture and continuous improvement of the charter school. 3. The board establishes a process for monitoring and reporting the school s performance in analyzing, addressing, and resolving issues or concerns raised by stakeholders. 5 Domain IV: Policy Development Domain Description: The board adopts, revises, and follows written policies in accordance with State Board rules and guidelines that include but are not limited to those that support improved student achievement, fiduciary responsibility, community and stakeholder engagement, organizational effectiveness, and continuous improvement. A. The governing board adopts, revises, and follows written policies that are clear, up-to-date, and in compliance with the charter school s strategic plan, state and federal laws and State Board rules and guidelines. 1. The board promotes policy development that is aligned with the school strategic plan and supports improved student achievement and organizational effectiveness. 2. The board, through board policy, adopts, revises, and follows effective procedures for: a. Policy development, adoption, revisions, and repeal b. Emergency adoption of policies c. Policy dissemination 3. The board solicits and receives recommendations from the School Leader on any proposed policies. 4. The board provides opportunities for public review on proposed policies before final board action is taken. 5. The board approves procedures for policies to be systematically reviewed. 6. The board holds the School Leader accountable for the consistent implementation of adopted policies. 7. The governance leadership team develops policies consistent with Domain VIII Ethics. 6 Domain V: Board Meetings Domain Description: In order to conduct official business for the purpose of improving student achievement and organizational effectiveness, the governance leadership team plans and conducts board meetings in accordance with the Open Meetings Act. A. The board announces and holds meetings in accordance with the Open Meetings Act (O.C.G.A ). 1. The board adopts a policy defining the process for developing board meeting agendas, to include, but not limited to: how the agenda is prepared and by whom; a process to remove or place items on the agenda; a process to allow requests for additional information on agenda items procedures through which the public can provide information, ideas, or input on agenda items. 2. Governing board meeting agendas consistently include components that demonstrate alignment with the school s strategic plan. 3. The School Leader posts board meeting agendas for public review. 4. 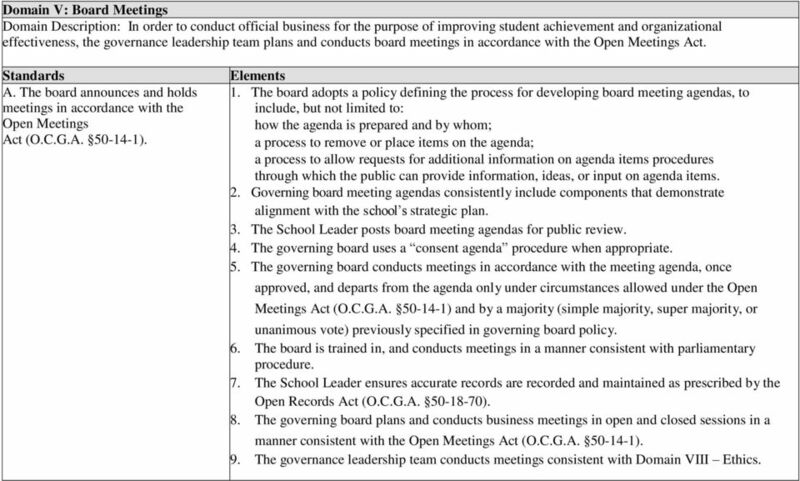 The governing board uses a consent agenda procedure when appropriate. 5. The governing board conducts meetings in accordance with the meeting agenda, once approved, and departs from the agenda only under circumstances allowed under the Open Meetings Act (O.C.G.A ) and by a majority (simple majority, super majority, or unanimous vote) previously specified in governing board policy. 6. The board is trained in, and conducts meetings in a manner consistent with parliamentary procedure. 7. The School Leader ensures accurate records are recorded and maintained as prescribed by the Open Records Act (O.C.G.A ). 8. The governing board plans and conducts business meetings in open and closed sessions in a manner consistent with the Open Meetings Act (O.C.G.A ). 9. The governance leadership team conducts meetings consistent with Domain VIII Ethics. 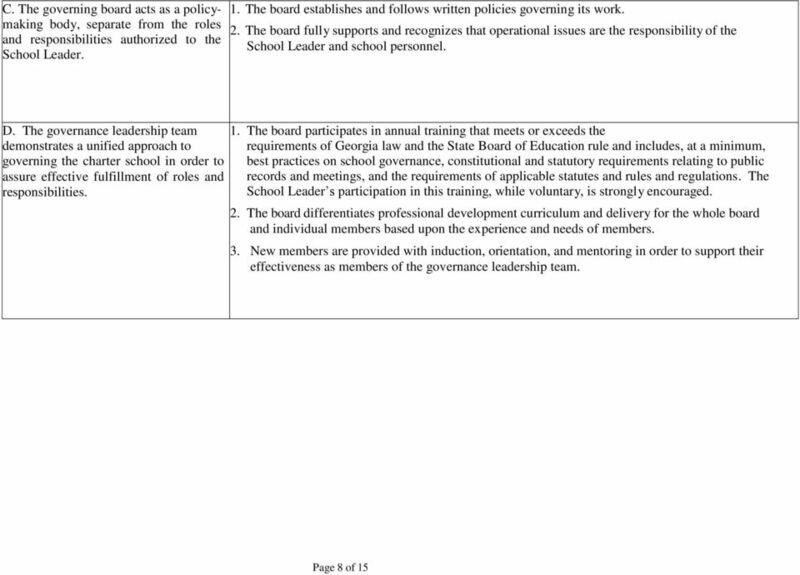 7 DOMAIN VI: Personnel Domain Description: The governing board employs, sets performance expectations for, and evaluates the work of the School Leader. A. The governing board employs a School Leader who acts as the Executive Officer of the school. B. The governing board evaluates the professional performance of the School Leader. 1. The board s search and hiring processes result in selecting a School Leader with the verified knowledge, expertise, skills and prior performance history that predict successful performance in execution of School Leader duties and responsibilities in alignment with the school strategic plan. 2. The board sets performance expectations for the School Leader through the adoption of a strategic plan, the adoption of a current job description, the adoption of professional development and evaluation plan, and adherence to relevant state law. 3. The governing board invests in the School Leader s professional development to ensure alignment to the school strategic plan, and current job description. 4. The governing board engages in planning for leadership continuity to support sustainability of improvement. 5. Board decisions regarding termination of School Leader employment are compliant with School Leader contract and relevant state laws. 6. The governance leadership team develops policies consistent with Domain VIII Ethics. 1. 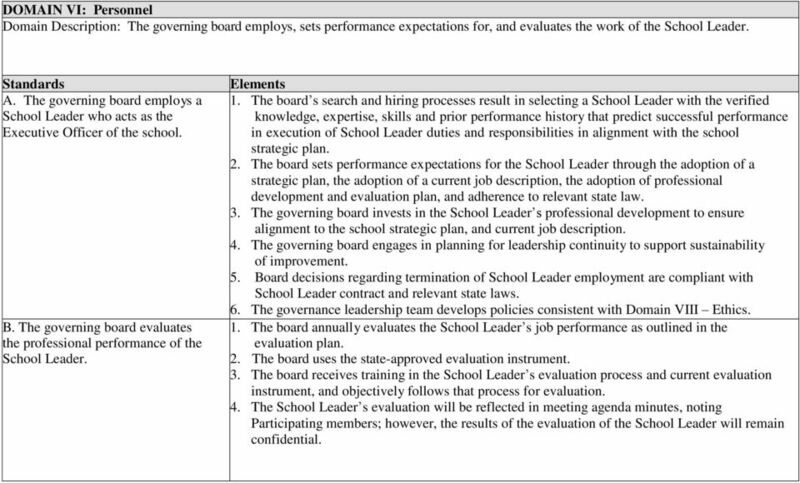 The board annually evaluates the School Leader s job performance as outlined in the evaluation plan. 2. The board uses the state-approved evaluation instrument. 3. The board receives training in the School Leader s evaluation process and current evaluation instrument, and objectively follows that process for evaluation. 4. The School Leader s evaluation will be reflected in meeting agenda minutes, noting Participating members; however, the results of the evaluation of the School Leader will remain confidential. 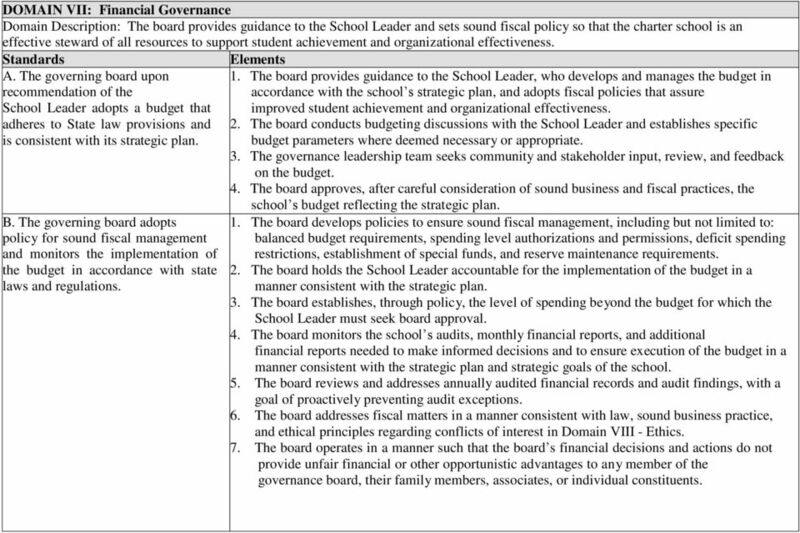 8 DOMAIN VII: Financial Governance Domain Description: The board provides guidance to the School Leader and sets sound fiscal policy so that the charter school is an effective steward of all resources to support student achievement and organizational effectiveness. A. The governing board upon recommendation of the School Leader adopts a budget that adheres to State law provisions and is consistent with its strategic plan. B. The governing board adopts policy for sound fiscal management and monitors the implementation of the budget in accordance with state laws and regulations. 1. The board provides guidance to the School Leader, who develops and manages the budget in accordance with the school s strategic plan, and adopts fiscal policies that assure improved student achievement and organizational effectiveness. 2. The board conducts budgeting discussions with the School Leader and establishes specific budget parameters where deemed necessary or appropriate. 3. The governance leadership team seeks community and stakeholder input, review, and feedback on the budget. 4. The board approves, after careful consideration of sound business and fiscal practices, the school s budget reflecting the strategic plan. 1. The board develops policies to ensure sound fiscal management, including but not limited to: balanced budget requirements, spending level authorizations and permissions, deficit spending restrictions, establishment of special funds, and reserve maintenance requirements. 2. The board holds the School Leader accountable for the implementation of the budget in a manner consistent with the strategic plan. 3. The board establishes, through policy, the level of spending beyond the budget for which the School Leader must seek board approval. 4. The board monitors the school s audits, monthly financial reports, and additional financial reports needed to make informed decisions and to ensure execution of the budget in a manner consistent with the strategic plan and strategic goals of the school. 5. The board reviews and addresses annually audited financial records and audit findings, with a goal of proactively preventing audit exceptions. 6. The board addresses fiscal matters in a manner consistent with law, sound business practice, and ethical principles regarding conflicts of interest in Domain VIII - Ethics. 7. The board operates in a manner such that the board s financial decisions and actions do not provide unfair financial or other opportunistic advantages to any member of the governance board, their family members, associates, or individual constituents. 9 DOMAIN VIII: Ethics Domain Description: The governance leadership team conducts themselves, collectively and individually, in an ethical and professional manner. A. The governing board adheres to, adopts and practices a Code of Ethics, avoids conflicts of interest, and annually reviews ethical standards to ensure and enhance governance structure and organizational effectiveness. 1. The board adopts and adheres to an ethics policy that includes, as a minimum, an ethical code of behavior based on the Charter School Model Code of Ethics. 2. The School Leader adheres to the Georgia Professional Commission Code of Ethics for Educators. 3. 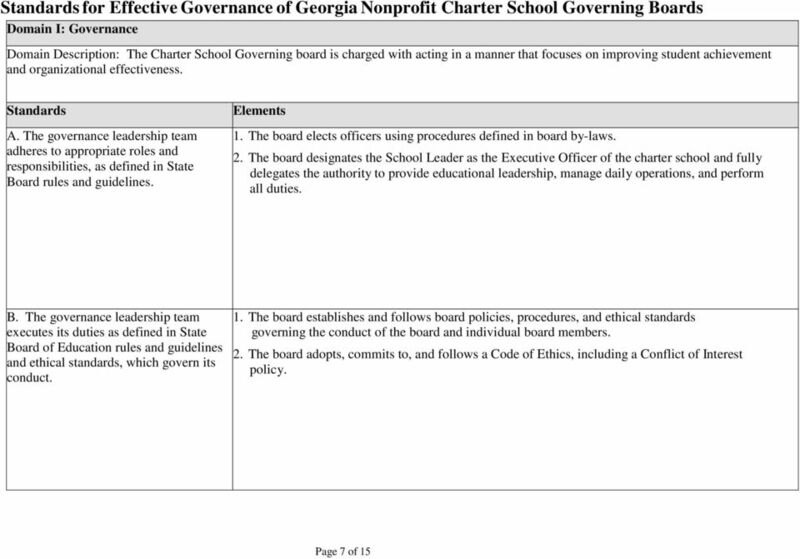 The board adopts and adheres to a Conflict of Interest policy that includes requirements outlined in the Charter Schools Conflict of Interest Provisions. ISS Institutional Shareholder Services Inc. The following Guidelines for Corporate Governance have been adopted by the Board of Directors ( Board ) of MAXIMUS, Inc. (the Company ) to serve as a guide for the exercise of the Board s responsibilities. -1- AMENDED AND RESTATED CERTIFICATE OF INCORPORATION OF THE NORTH AMERICAN ENERGY STANDARDS BOARD, INC.
GOVERNING POLICIES. Article II Timely, relevant information exists to enhance Professional School Counselors level of skill and professionalism. Corporate Governance Guidelines Altria Group, Inc.